Baseball players can be jerks. Sometimes they ignore fans or practically snarl at them or walk right by when approached for an autograph or a photo. And talent is not a good indicator one way or the other of what kind of a human being a player is. Bryce Harper has immense talent that is self-evident. A 20 year-old with the maturity of a 35 year-old in his approach to the game, he has an equal maturity as a just plain-old decent human being. The picture above taken by Washington Post photographer John McDonnell (who used to work for the Loudoun Times Mirror eons ago) features Bryce shaking hands with Little League player, Gavin Rupp. Gavin has an inoperable tumor in his brain. Prior to his terminal prognosis, he had undergone surgery and other treatments and still kept his starting shortstop position on his youth travel team. Word of Gavin’s situation reached the Washington Nationals and so it was that last Friday with the San Diego Padres in town, the club invited Gavin, his parents and his siblings to the ballpark. As Gavin’s family watched San Diego take their batting practice swings, Bryce Harper emerged from the dugout. Harper asked if they wanted to go out on the field. And they did. 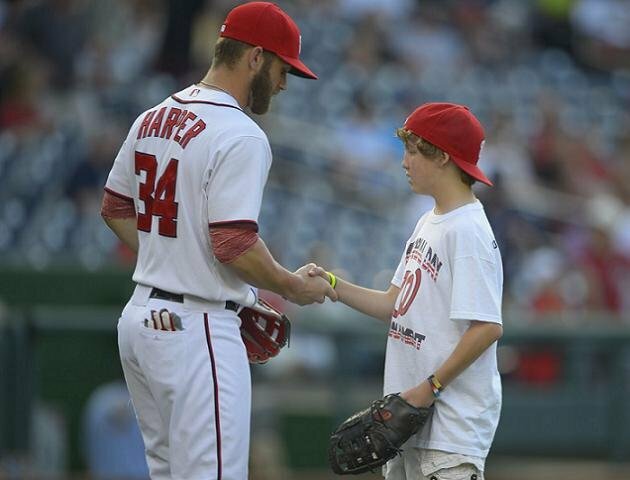 For a full hour, Bryce engaged the young man, took the lead in drawing him out and making him feel welcome and comfortable, gave the kid the cap off his head and treated him with the greatest dignity. Ball players don’t do this sort of thing for sixty minutes. Here’s The Post’s Adam Kilgore with the full story. And then came July 4th. Bryce Harper lives in a penthouse apartment in my building in Arlington. He’s a rare sight. He drives his white Mercedes with the Bam Bam 34 plates directly into the garage, gets in the elevator to his floor and the only people who ever run into him are those folks who just happened to select the same elevator. Every 4th of July, the management of the apartment building holds a little party for the tenants in the common ground with music and cotton candy, popcorn, burgers and dogs. And there he was this year, in a t-shirt, shorts and red sneakers, holding his sister’s brand new baby in his arms, hanging out with his girlfriend, family and a couple of other friends while his chocolate Labrador retriever, Swag, rolled in the grass. There were about 300 people at this event. Everyone knew Bryce was there. And everyone left him alone. Bryce, after the Nats had played the traditional July4th 11am game, felt comfortable enough to hang out with the residents and the residents minded their own business and just let him be. Finally, Harper and girlfriend left the common ground, walking to a nearby restaurant and it was there he was finally approached- not by a resident, but by a casual fan walking down the street who happened to be wearing a Harper #34 uniform shirt. I overheard the exchange. “Oh my God- you’re Bryce Harper!” Bryce stopped and smiled. He immediately posed for a cell phone camera shot and shook the fan’s hand before moving on. He really does love the fans. At the player’s parking lot at National’s ball park, they’ll yell to him as he’s making his way to the white Mercedes and he waves and calls back at them with an ear-to-ear grin. I’ve had heroes in my life. Mickey Mantle was one of them. He was Bryce’s hero too. Bryce wears #34 because the numbers 3 and 4 add up to 7- Mantle’s number. But my Mickey was deeply flawed. The first one, late in his life, to confess he had squandered one of the great baseball careers of all time, drinking and partying with the likes of Whitey Ford and Billy Martin. We all loved Mickey for his raw skill and seeming humility but in the end it turned out the bright lights were too much for the kid from Oklahoma. Too much pressure. Too much fear he would die young like many of the men in his family including his father. Too much, too soon. Harper has none of this baggage. He has a large and supportive and healthy family. He is the definition of clean living. And he wears all that fame and talent with a great humility off the field, a great arrogance on it- the way it should be. It is so nice to have a hero again. A guy you can look up to not just for his stats or hall-of-fame potential- but for his decency and kindness and understanding that while damned important, baseball, is part of life, not all of it. As for Bryce, I’m so happy to hear that he’s the good guy that he seems to be from my average fan perspective here in the recliner. Thanks for that insight.